We bid in auctions in our right sidebar for particular reasons, mostly because they know what the word “auction” means, especially when it comes to coins. Some houses on Proxibid are no better than eBay “Buy It Now” sellers, ensuring that they get the going-rate for a coin. Here’s how you can tell the difference to select your own favorite sellers on the portal. 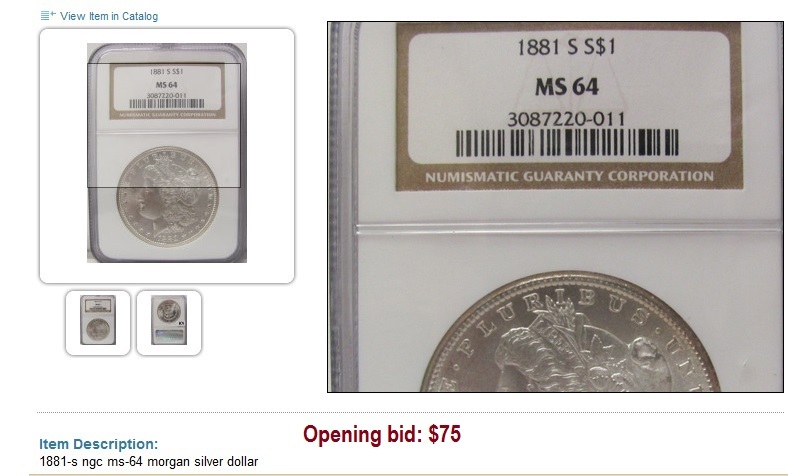 Here’s the opening bid on an 1881-S Morgan dollar MS64 graded by NGC. This is one of the most common Morgans available today. You can check the certification number with NGC to identify the exact retail value of this particular coin. NGC says the coin is worth $91.20. 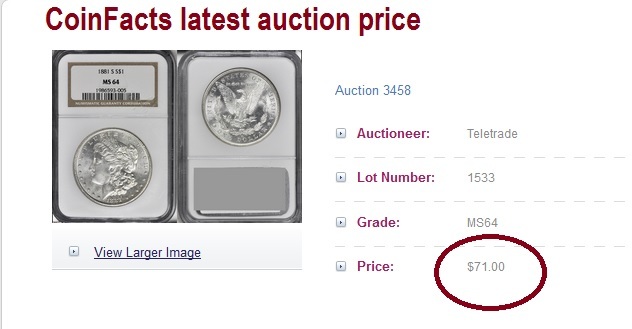 You can check the latest auction price for this year, date and mint mark slabbed by NGC using CoinFacts. We come up with this screenshot from CoinFacts leading us to a Teletrade auction in which the coin sold for $71. This particular seller charges an 18% buyer’s fee and adds $1.75 per lot handling fee, in addition to shipping. If you eliminate shipping, you will be paying $90.25 cents, ironically what you would pay in a local coin shop, saving shipping fees. It’s perfectly all right to pay over retail in a Proxibid auction if you are competing against another bidder for a desired coin and the seller is conducting a real auction with an even playing field for onsite and online bidders. You are paying for the excitement, which Proxibid technology brings to you in a masterful way. However, in eBay “Buy It Now” like auctions, you may not have that experience because the seller has ensured that you not only won’t “steal” a coin in a real auction; you’ll be paying retail if only one bidder hits the bid button. This entry was posted in Best Practices and tagged American Numismatic Association, Auctioneers, AuctionZip, Best Practices, Coin Auction, eBay, iCollector, National Auctioneer Association, Proxibid, Proxiblog. Bookmark the permalink. ← Grade the Quality of Your Coin Photos! “However, in eBay “Buy It Now” like auctions, you may not have that experience because the seller has ensured that you not only won’t “steal” a coin in a real auction; you’ll be paying retail if only one bidder hits the bid button.” Gentlemen, that is not a correct assessment of an eBay Auction with a Buy-It-Now component. In that type of auction with a BIN, a buyer can bid at the Starting Price and when he does, the BIN button goes away and it becomes strictly a bidding competition where the last bid placed wins the item. Gary, thanks for your comment. You seem to be discussing one type of BIN–auctions with a starting bid lower than the BIN. However,there are thousands upon thousands of BIN “auctions” on eBay–almost all of them way above the retail price.